Little, Brown Books for Young Readers, 9780316306843, 192pp. 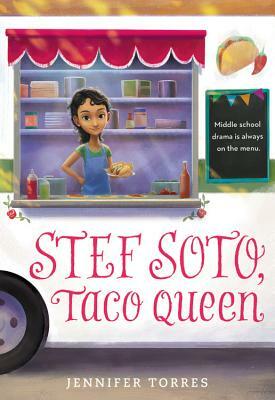 A heartwarming middle grade about family, friendship, and finding your voice (plus, tacos!). Seventh grader Estefania "Stef" Soto is itching to shake off the onion-and-cilantro embrace of Tia Perla, her family's taco truck. She wants nothing more than for her dad to get a normal job and for Tia Perla to be put out to pasture. It's no fun being known as the "Taco Queen" at school. But just when new city regulations are proposed, and her family's livelihood is threatened, she will have to become the truck's unlikely champion. In this fun and multicultural middle grade novel, Stef will embrace her identity and discover what matters most. Jennifer Torres works as a freelance journalist and leads an early literacy campaign on behalf of the University of the Pacific. She is the author of Flor and Miranda Steal the Show, Stef Soto, Taco Queen and Finding the Music/En pos de la musica and lives with her husband and two little girls in central California.